Cafe Panic is a excellent game of cafe time management game. 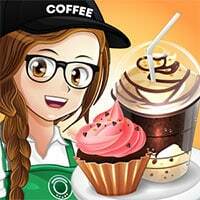 In the game your goal is to become a successful barista working at a popular coffee shop. Manage customer orders and keep everyone satisfied. Pay attention to the customers as they enter the shop and quickly attend to them and take their orders. Make sure to give them what they want, if you do it wrong it’ll affect your tip level. Be quick on your feet, otherwise customers will grow impatient and leave. As you progress and build up a reputation you can unlock new items to serve your customers with – your orders will become more challenging but you will also have more fun! When you get to a certain stage, you can even unlock new coffee shops around the world! Have fun trying your hand at managing a coffee shop and see if you have what it takes to be successful in Cafe Panic Game!